The Centre’s Narendra Modi government is believed to have made up its mind on withdrawing the medals given to five senior police officers, who recently joined the sit-in protest of Chief Minister Mamata Banerjee. These officers are Director General of Police Virendra Kumar, ADG-Security Vineet Kumar Goyal, ADG-Law and Order Anuj Sharma, Commissioner of Police (Bidhan Nagar) Gyanwant Singh, Additional Commissioner of Kolkata Police Supratim Sarkar. Similar action is also being contemplated against Kolkata Police Commissioner Rajeev Kumar, who was at the centre of the controversy that prompted Banerjee to launch an impromptu sit-in protest against the central government. Among other punitive action being considered, the Centre may also stop these officers from being posted on central duty for a length of time. If the central government’s home ministry indeed decides to go ahead with its plans, then these officers may be stripped off their medals or decorations, conferred on them for meritorious services. They will also have their names removed from empanelled (seniority) list, reported news agency PTI. Banerjee had started her sit-in protest to ‘save democracy’ against the CBI’s attempt to arrest Kolkata Police Commissioner Rajeev Kumar. The members of the CBI team were later detained by the Kolkata Police. Alarmed with the unprecedented development, the central government had deployed paramilitary forces to guard the regional office of the CBI in Salt Late City. Banerjee had later ended her protest after three days in light of the Supreme Court order directing the CBI to not arrest the Kolkata Police Commissioner or take any coercive action against him. 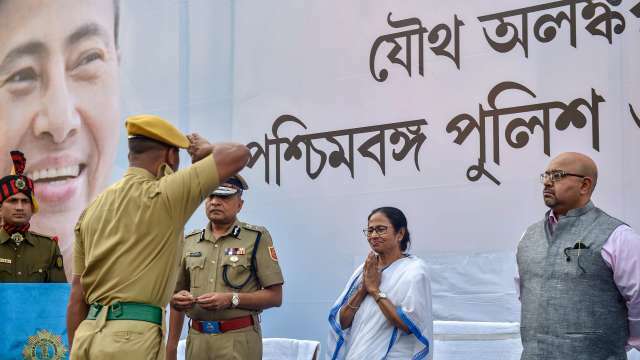 The firebrand Bengal chief minister had termed the reprieve by the Centre as her ‘moral victory’.